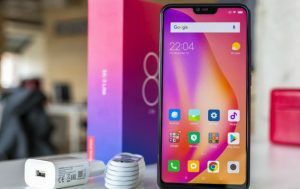 Xiaomi MI 8 Lite comes out from the bunch of Mi series in Bangladesh. We don’t actually remember how many Xiaomi phones have been released in Bangladesh. Since under the MI series flagship, numbers are many. But we have been using MI 8 lite for a couple of days. and since we are about to give your review on it, so we have to remember the name of course. 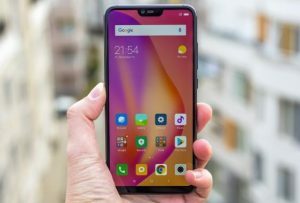 If you are one of the sports want to buy the new Xiaomi MI 8 Lite, then this review is going to help you. So sit back and relax as we are about to expose what’s on the new Xiaomi Mi 8 Lite. First of all, we liked the coloring of the box of the new Xiaomi MI 8 Lite. The coloring of the box gave us a vibe that this phone is gonna give you premium feedback. As you unbox the phone look at the envelope, you will see the SIM ejection tool, a USB Type-C converter, 3.5 mm audio jack, a silicone case with a regular piece of paper works, and finally, you get to see the Mi 8 Lite device. Lastly, you will find a USB type C cable and 5 volts to the ampere wall adapter. Xiaomi MI 8 Lite comes with outstanding colors and you have to agree that it will catch anyone’s eye even if they don’t like the Xiaomi brand. The phone comes with 3 colors but in Bangladesh, you are getting the phone in Aurora Blue and Midnight Black. Since the phone has a glass back that blends in with the side bumper smoothly, you’ll have a premium feel when you’ll hold the phone with your hand. In addition, you’ll see the dual camera set up in the back as well as the fingerprint sensor which is blazing fast. On the side, you’ll find the volume keys and the power button that is placed very conveniently. On the left, you’ll see a hybrid sim tray slot. On the bottom, you’ll find the elegant positioning of the primary microphone, 3.0 supported USB Type-C port, and a speaker. The top has just a secondary microphone. Xiaomi MI 8 lite has an earpiece and 24-megapixel sensor with a 0.9 ultra pixel size on the front notch. Besides, there’s a small notification light and other important sensors as well on the front notch. Xiaomi MI 8 lite has side bezels on the display that’s narrow enough with a less amount of bottom chin. The Mi 8 Lite comes with a 6.26-inch FHD+ IPS LCD display which is quite decent. Now, the blacks aren’t as deep as an AMOLED panel as this is an LCD panel. The color and contrast of the display seemed to us much better than other Xiaomi phones with this price. The touch response seemed very intuitive to us, so we can ensure you that you’ll obviously have a better media consumption experience. The 1080 x 2280 pixel resolution is obviously good enough to impress you. The display is hosted by 19:9 aspect ratio. 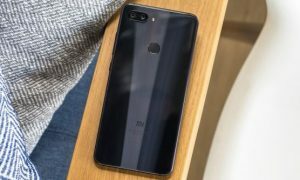 The screen seemed similar to Xiaomi MI 8 to us and a bit bigger than MI 8 SE. However, Xiaomi MI 8 Lite has similarity with Xiaomi Mi 8 when it comes to dimension. The phone also comes with a 2.5D glass design. Xiaomi MI 8 is powered by Snapdragon 660 which is being used in Xiaomi mid-range phones for a long time. It possesses an octa-core CPU with 4x 2.2GHz Cortex-A73 CPU cores along with 4x 1.8GHz Cortex-A53 core. Do you love 3D intensive gaming?? Xiaomi MI 8 has the Adreno 512 GPU that will make sure you are not left without a good gaming experience. The performance of the Snapdragon 660 is surprisingly good for a mid-range processor. During its Speed Test G head-to-head with the Samsung Galaxy A7 (2018), The Mi 8 Lite managed a time of 3:00. If you are a PUBG lover, then we got good news for you. We tested the device with both Asphalt 9 and PUBG Mobile for an hour and got very smooth gameplay feedback. The Snapdragon 660 comes with a built-in Qualcomm X12 LTE and it supports 2G, 3G, and 4G in a very satisfying level. You don’t need to worry about the speed because LTE reaches up to 600Mbps download speeds. In addition, Xiaomi MI 8 lite comes with Qualcomm’s Artificial Intelligence Engine (AIE) with Hexagon DSP and its Hexagon Vector Extensions. Xiaomi MI 8 Lite’s 4GB of RAM (6GB on some models) is coupled with its Snapdragon 660. The internal storage comes with 64 GB as well as 128 GB for some models. If you rely on benchmark numbers, then we want to let you know, on Geekbench’s single-core tests it scored 1629, and on its multi-core tests, it scored 5898. This puts the phone in the same position as the Galaxy S7 with a Snapdragon 820. AnTuTu tested its GPU and gave the score of 143,306. The scores from AnTuTu puts the phone in the same place as a flagship device from 2016. Xiaomi MI 8 lite is brought to you with Android 8.1 Oreo via MIUI 10. If you are not familiar with MIUI, then you should know that MIUI is Xiaomi’s custom Android firmware. This firmware includes lots of features that are not available in vanilla Android. You can have full-screen gestures that can be used for UI navigation. You’ll have Mi Drop, for wireless file transfers. You’ll have Dual Apps system that will allow you to use an app with two accounts. You’ll also have Second Space. With Second Space you can use different passcodes or fingerprints to access different profiles. We were impressed to see a better recent apps menu that has lots of UI tweaks and redesigns. You’ll love the themes and the icons but unfortunately, there’s no app drawer. Xiaomi MI 8 lite comes with a dual camera set-up on the back. A primary camera is a 12MP unit that has an f/1.9 aperture. The primary camera has 1.4µm pixel size with dual pixel phase detection autofocus. It is teamed up by a 5MP camera that is used for depth sensing. You can use the depth camera to create pictures with a bokeh effect. You can do this by blurring the background while you leave the subject untouched. We saw that the portrait mode of this phone works very fine. 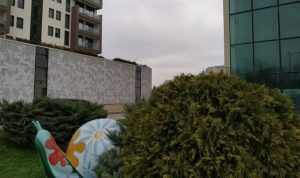 The AI mode of the cameras applies color presets according to the detected scene. The AI mode can certainly bring more vibrancy to some shot if sometimes these become a little oversaturated. 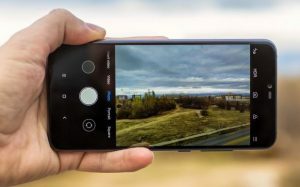 You can ignore the fact that Xiaomi MI 8 lite has the lack of OIS as Mi 8 Lite is a capable video shooter. You can easily make 4K videos at 30fps and 1080p videos at 60fps with electronic image stabilization. 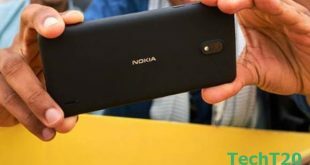 When you will see that you are having 1080p slow mode video at 120fps and 240fps HFR at 720p, you’ll not get any regret buying this phone. If you are a selfie lover then get ready to get your mind blown as this phone has a 24- megapixel front camera. This selfie camera comes with few tricks that include 1.8μm wide pixels, AI light adjustment, AI scene detection, and AI beauty mode. The front camera comes with a fixed focus but hopefully, the camera won’t disappoint you as we did not get any negative issue regarding sharpness and details. Xiaomi MI 8 Lite comes with a 3,350mAh battery. The battery is quite good in size especially for a device that has a 6.26 inches display. As the battery is quite big, it will definitely give you all-day battery-life support. If you rely on our testing, then we will say you’ll get six hours of screen-on time per charge. The number will certainly increase if you do less task with your phone like streaming HD videos nonstop with WiFi. The screen brightness will have certainly have an effect on your battery life. Xiaomi MI 8 lite supports Quick Charge 3.0 but bear in your mind that the supplied charger is only a 10W, non-QC unit. Xiaomi MI 8 Lite is surely a very good phone if not the best or one of the best. Every phone has pros and cons, so you’ll always find one or two things you may not like. However, if you are not one of those people who seek out negativity out of everything, you can buy this phone without any fear. We appreciate that it has a very good build quality along with the solid camera experience. If you do face any problems, then let us tell you that you can always easily overlook those issues as they are not that important. The lack of 3.5 mm jack can surely bother you, but it’s MIUI rich software can be greatly appreciated. We feel that in this very competitive market, with all these phones of different brands with new features, Xiaomi has a good track record.